bed and 2 single beds. The property is fully fenced. Our apartment is very spacious and has lots of room. Regular comments from guests is when they enter “it doesn’t look that big in the photos “. only one negative. I have never stayed in accommodation where soap has not been provided which I found unusual. They were kind and gave us some. Good location, for us especially as we had friends staying at the camping ground, just across the road. Easy beach access. 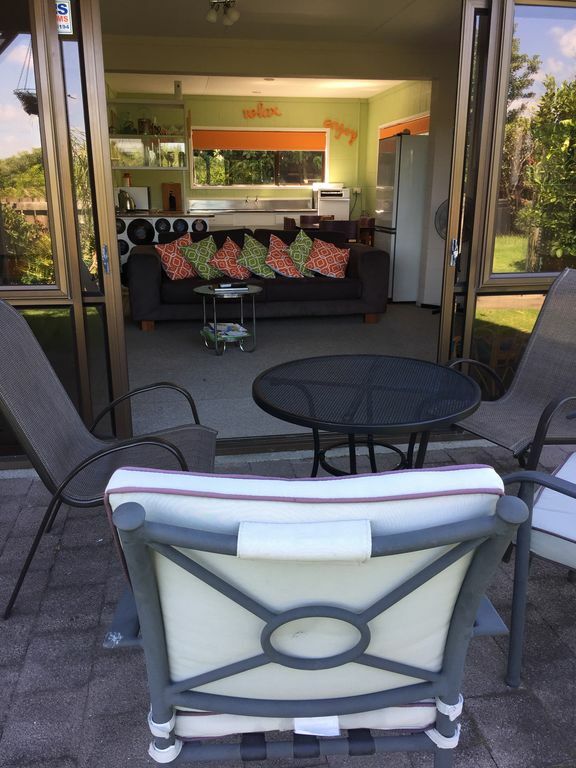 Clean and tidy unit, spacious living room, and outside chairs and table if required. Had a lovely stay here. Sue was a lovely host and we felt right at home. Nice and close to the beach and the property was clean, cosy and had everything we needed. Also loved the visits from Toby the dog :) Thanks for having us. Would book here again. Really enjoyed our stay. We loved the peace and quiet and the friendliness of the owners . Peaceful setting amongst a very healthy garden. The unit was cool in the heat of summer. Great for a relaxing holiday. Appreciated having wifi. A beautifully clean and well equipped place to stay with great shade to be had under the grapevine on a hot day. We had a lovely time. Thank you.